While kids across the country enjoyed their summer vacations, more than 50 DTE Energy volunteers and skilled laborers from local contracting companies kicked off a major renovation effort at Detroit’s Randolph School. DTE Energy, in cooperation with the Detroit Workforce Development Board and Detroit Public Schools Community District, is lending a hand to help transform the city’s Randolph Career Technical Center back into a gem of the district’s construction trades program. The effort is part of a multifaceted project championed by the Detroit Workforce Development Board that includes renovating four classrooms and several common areas, developing improved curriculum and programming, recruiting hundreds of students, and raising money for supplies and equipment. DTE is helping by providing project management services for the project along with volunteer skilled labor to reduce costs. In addition to those services, the DTE Energy Foundation donated $500,000 to the project. The architectural work is being contributed by Gensler and the construction management is being donated by Barton Malow. Randolph, located on Hubbell Street in northwest Detroit, offers technical training to students in fields such as masonry, carpentry, electrical and plumbing. But the school has seen declining enrollment, has out-of-date equipment and worn-down classrooms; as a result, the student population stood near 100, which threatened closure. The goal is that this fall, 300 new students will enter the rejuvenated building with refreshed curriculum, classrooms and labs. Jay Williams, a senior project manager at DTE and former Randolph student, is DTE’s volunteer helping with overall project management. “For me, this project is personal,” Williams said. “I grew up here, attended school here. So being able to give back and bring this school back to life is something I never dreamed I’d have the chance to do. Williams said that on Friday, workers from DTE, Infrasource Services, Corby Energy Services, Motor City Electric Co. and Limbach contributed approximately $250,000 in in-kind donations – most of that in the form of demolition of the areas that will be renovated later this year. 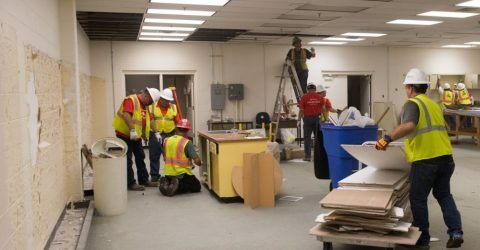 The skilled trades workers removed old furniture and carpet, removed blackboards and bulletin boards from walls, and started the process of repairing out-of-date lighting and HVAC equipment.